GridCast: live and behind the scenes of grid computing: Live from the Digital Agenda Assembly in Brussels! Live from the Digital Agenda Assembly in Brussels! Over 800 of us are at the European Parliament today for the closing day of the Digital Agenda Assembly on driving digital growth by innovation and user empowerment. As an introduction, we were told that around 4000 people watched the live feeds yesterday and the #da12social hashtag trended in 2 European countries in third place. As the moderator put it, this is an event reaching the parts that other conferences do not reach. Alexander Alvaro, Vice President of the European Parliament set out some facts and figures - tweets are no longer just to be heard in the countryside, cookies aren’t necessarily made of dough and Trojans aren’t wooden horses. The ICT industry grows at 3.8% every year, which is an increase some other sectors can only dream of. E-commerce in Europe brings in 660 billion Euros a year. Despite this, businesses are still worried about trading across international boundaries, due to the complexity of regulations. 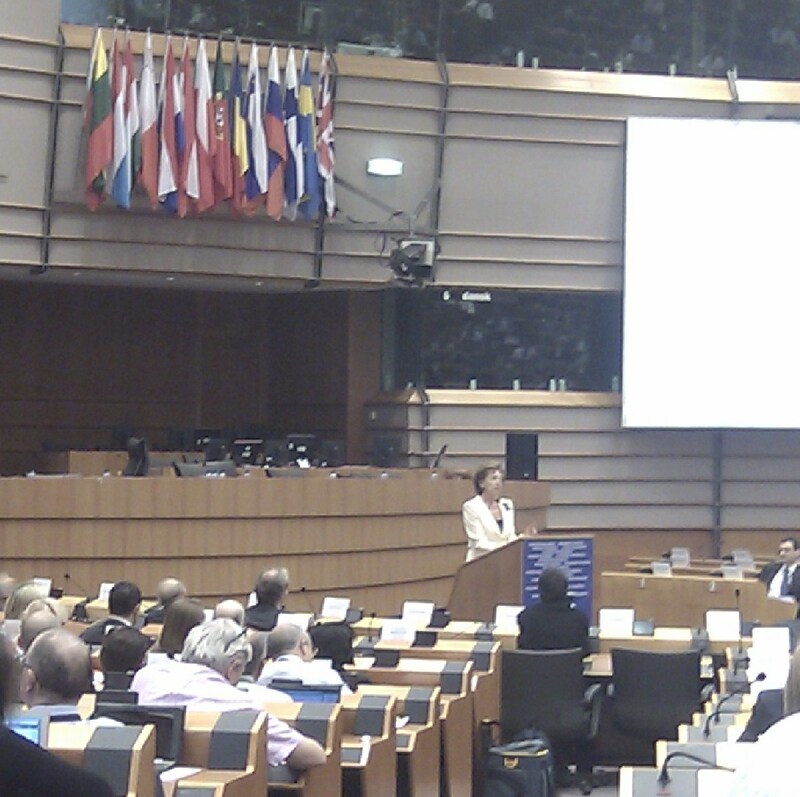 Neelie Kroes, Vice President of the European Commission then got up to speak, causing a flurry in the Twittersphere. She started off with ‘bigging up’ the B4RN rural fibre project bringing broadband to the rural north in the UK, showing off a pink bracelet presented to her by @cyberdoyle. As journalist Bill Thompson put it (@billt). “The thing about @NeelieKroesEU is that when she reels off a list of ICT tools & services you know she understands what she's saying.” The full speech is online already. Kroes reminded us that the Digital Agenda initiative is now half way through. With Turing’s 100th birthday tomorrow marking the birth of computing in the UK over 70 years ago, where are we now? Mobile roaming rip offs have been ended once and for all from 1 July, and agreement on the radio spectrum will bring down the barriers to mobile roaming. “We do know that the internet is a platform for astounding creativity. If it has a limit – we haven't found it yet. We're not even close,” says Kroes. We stand on the cusp of ensuring the investment, the rules and the attitude to power a digital future. However, we are not there yet - one in three European households have no internet connection; one in four adults have never gone online. And while great ideas are not lacking in Europe, there are still barriers in the way of innovation. Kroes outlined some ideas to get ahead – push ahead on cloud, make the internet secure, deliver fast broadband and stimulate entrepreneurship. Not only that, ICT can boost the quality and efficiency of our public services. Kroes also reiterated her call for open data as a source of future innovation. The rest of the morning was handed over the convenors of yesterday’s workshops on converged media platforms, broadband and ecommerce, cloud computing and security. Establishing trust has been an overarching theme in these expert workshops - customers trusting the internet, companies trusting customers. Establishing a trustworthy digital identity for us all online is important – plus making it difficult for someone to steal it. As a source of the 'app economy', mobile penetration is apparently greater than for electricity, clean water …. and toothbrushes. Personally I would make sure my teeth were clean before reaching for my mobile to tweet good morning, but perhaps that’s just me. Discussions in the panel sessions were wide ranging to say the least, both from the panel members, from the delegates and from the social media sphere. There was disagreement on whether Europe actually is a ‘digital desert’ or not. Skype is of Scandinavian origin, and the Angry Birds company is based in Helsinki (I impressed my tablet-happy son recently by telling him I’d visited their offices). One theme that did come across was that European businesses need to think globally, not just about a single European market. SMEs can struggle to break into markets already occupied by the big players, such as cloud computing – but if we have a value proposition, and something unique to offer the world, we should go for it and ask if it is really the regulations that are blocking us.. or our attitudes and corporate culture. As Yossi Vardi, early stage internet investor put it, wearing a jacket and tie can cut off blood flow to the brain – that’s why you don’t find many entrepreneurs in formal wear! Konstantinos Papamilitiadis of Taptu reminded us that innovation is not just about inventing the wheel necessarily, it can be about making it go faster. Some final ideas thrown out from the floor before we all went for lunch were on creating a European online platform to encourage young people into setting up businesses, the role of Horizon2020 in funding innovation without loading us all with too much bureaucracy and using accelerators to kick start small businesses. Food for thought while we all replenish our own nutritional batteries (and find some power for our laptops/tablets/smart phones in a building apparently lacking plug sockets almost entirely). Agree with Bill, Neelie knows her stuff. We all now need to do our bit, and make sure the connectivity is there for everyone who wants it, and is fit for purpose. Who knows which bedroom the next global business is going to be born from? To make every citizen digital we first need the pipes, then lots of people who see a reason to use them, then lots of innovation will happen. As many areas of Europe limp along with bad connections, limited mobile, rubbish public wifi and economic uncertainty folk naturally stay with what they know, ie analogue, and won't change. We have to make IT ubiquitous and easy. Then they Will Come.